MORE than 50 students were honoured at a certification ceremony held in McAuley Place Arts & Culture Centre in Naas, on Thursday March 28. Students from across Co Kildare gathered with their friends and loved ones for the event which recognises their achievements across a range of personal and vocational development courses. Representatives from the HSE and the KWETB were also be in attendance. 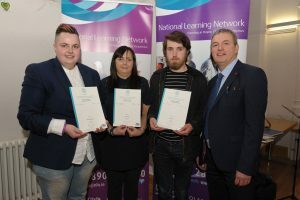 The event began with an address by NLN Area Manager Anthony Rowan, who acknowledged the transformation many students have undergone during their time at National Learning Network. “Students come in the door looking to change, wanting to make a change, and we’re delighted to be the conduit for that change. They leave with qualifications, skills, friendships and work experiences they just wouldn’t have gained elsewhere. Many get jobs, go on to further education or stay with us, but all gain something from the National Learning Network experience,” he said. Jobstart student Mason Moore suffered a mental health breakdown while studying for a degree in Limerick Institute of Technology. Once recovered NLN offered the ideal stepping stone to take up studying again. “My aim after being in hospital was always to go back to university but I wanted to study finance. NLN was recommended and Jobstart was the perfect opportunity for me to get back to further education, it got me back on my feet,” he said. Sandra Fox, from Kill, who completed the IT and Business course and is now studying humanities and has become a personal trainer, said: “I came to NLN Naas because I wanted to upskill in computers and go back to work after being a full-time mam. I was surprised how many modules I could choose from to suit my career path. The modules are all very in depth and suit the modern workplace. Speakers. Mason Moore, Sandrea Fox, Mark Nolan and Anthony Rowan, Area Manager NLN. “On a personal level it gave me the confidence to use a computer properly and the learning environment is very friendly which helped build my confidence and self-esteem for returning to work. Students receive a range of awards from QQI accreditation courses. The learners have shown great commitment throughout their variety of HSE and Kildare and Wicklow Education and Training Board courses with QQI accreditation. In Kildare, National Learning Network provides supported vocational and community-based rehabilitative training programmes to people with disabilities, people with mental health difficulties and others who are distant from the labour market.